GOP Rep. Ryan On Obama's Plan: 'Why Would We Want To Do This Again?' : The Two-Way The House Budget Committee chairman airs his doubts about President Obama's jobs plan. 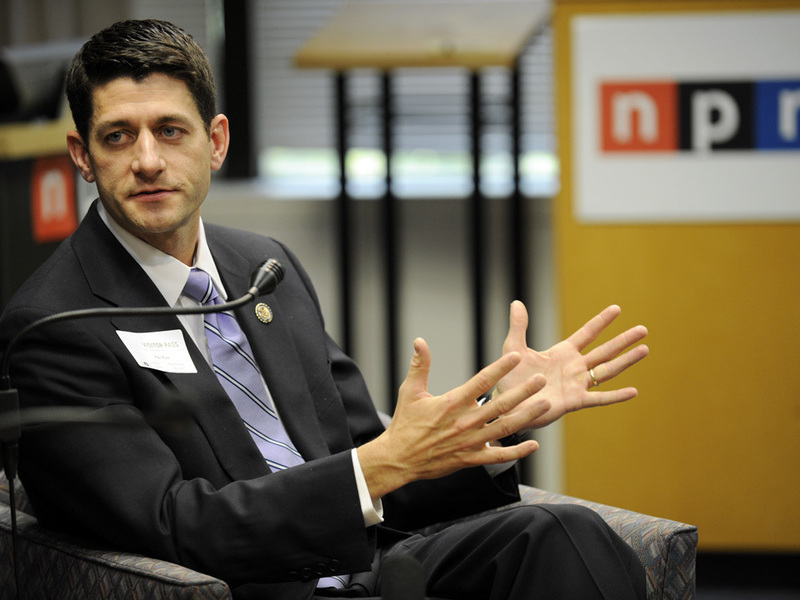 Rep. Paul Ryan (R-WI) at NPR headquarters in May. Earlier this month on Morning Edition, Treasury Secretary Timothy Geithner made the case for President Obama's latest jobs plan, saying it "would have a substantial, powerful effect on strengthening the economy." Click here to read and hear his conversation with host Steve Inskeep. Today, House Budget Committee Chairman Paul Ryan (R-WI) told All Things Considered host Michele Norris why he and other Republicans in Congress oppose the president's initiative. Not only are Republicans against any tax increases, such as those the president would like to see on the wealthiest Americans, they also are against temporary tax credits and other short-term measures, Ryan said. What business executives tell him they want is certainty, the congressman said. And though the administration has said the president's plan would be paid for thanks to some spending cuts, the closing of some tax loopholes and some tax increases, Ryan made the case that there would still be too much "borrowing and spending" in the package. "If borrowing and spending in Washington was the secret to economic growth, we would have had it by now because we've done more of it than we have in the modern history of our country," he told Michele. "If this has proven not to work already ... why would we want to go do this again?" In Ryan's view, Keynesian economics has been discredited and "for every dollar the government borrows and spends it does not necessarily translate into more than a dollar's worth of economic activity" because that also means a dollar has been "taken out of the private economy in the first place." What's more, he argued, "all this extra government borrowing and spending ... is doing damage because it is adding more uncertainty" about the future of the nation's economy. There are, though, things the president and Republicans do agree about, Ryan said, including the need to pass stalled trade agreements, reform the tax system and reduce government regulation. Much more of Michele's conversation with the congressman is due on today's All Things Considered. Click here to find an NPR station that broadcasts or streams the show. Later, we'll add the as-broadcast version of the interview to the top of this post.